Japan Says It Wants To Resume Larger Annual Whale Hunt : The Two-Way Despite a ruling in March by the International Court of Justice that the country's whaling is not scientific, Prime Minister Shinzo Abe says he wants to resume the Antarctic hunt. 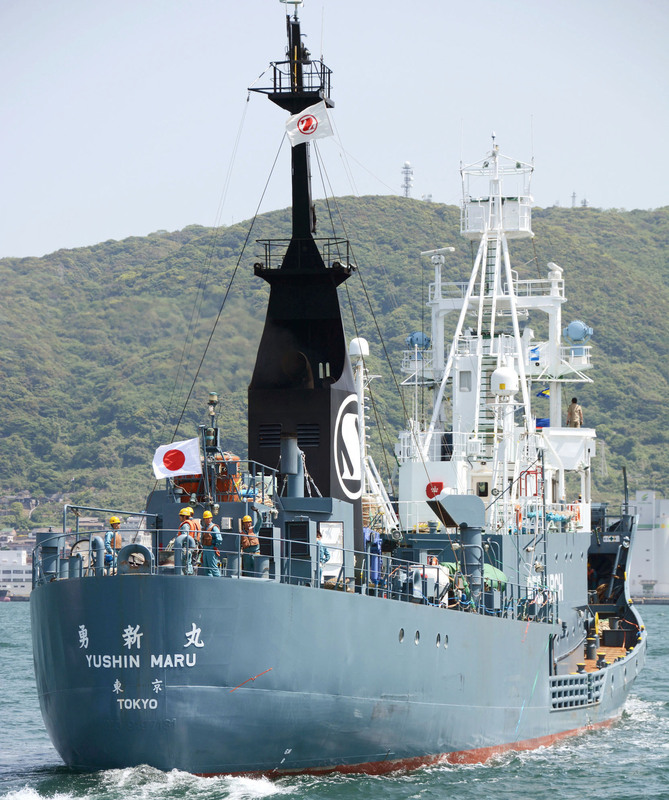 The Japanese whaling ship Yushin Maru leaves Shimonoseki port in Yamaguchi Prefecture, southwestern Japan, last month. Japan's prime minister says he wants to expand whaling operations after they were temporarily scaled back. Japan, which earlier this year said it would scale back what it has described as "research whaling," is signaling that it wants to go back to a larger hunt. "I want to aim for the resumption of commercial whaling by conducting whaling research," Prime Minister Shinzo Abe said. Japan, which is a signatory to a 1986 International Whaling Commission moratorium, has nonetheless continued to hunt cetaceans using a loophole in the ban that allows taking some whales for scientific purposes. Despite the claims of science, the meat from Japan's annual hunt in the Antarctic and along its Pacific coast is can routinely be found in upscale restaurants. In March, the International Court of Justice ruled that Tokyo's whaling operations were not in fact in the name of science, and a month later, Japan's Fisheries Minister Yoshimasa Hayashi said the Pacific catch target would be lowered. "Japan had stopped the hunt in the Antarctic after the ruling but vessels have carried on hunting Minke whales along Japan's northern coast. Japan says these are also for research purposes. "How Mr Abe intends to get around the international court ruling concerning the hunt in the Antarctic remains unclear, the BBC's Rupert Wingfield-Hayes reports from Tokyo. "Referring to the respect given to whales by those in towns where whaling takes place, Mr Abe said it was 'regrettable that this part of Japanese culture is not understood.'"